This week’s key event is the U.S. Federal Reserve’s Federal Open Market Committee meeting on March 15 -16. The committee is expected to discuss raising interest rates at the meeting, but don’t expect them to do so. 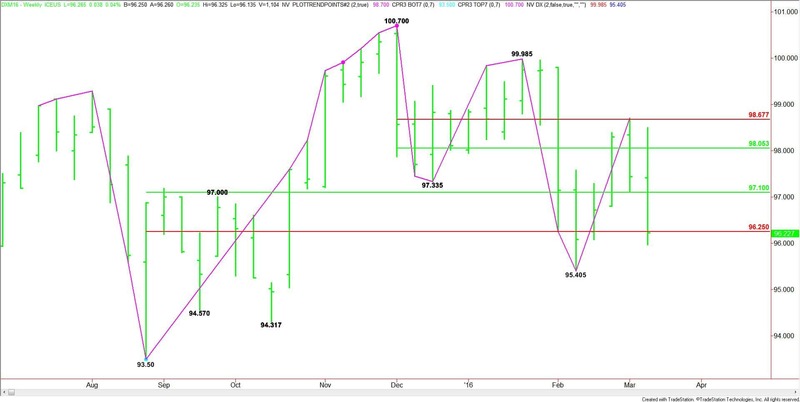 This assessment isn’t based on my opinion but rather the Federal Funds Rate futures contract and the CME Group FedWatch Indicator. These tools have long been used to express the market’s views on the likelihood of changes in U.S. monetary policy. 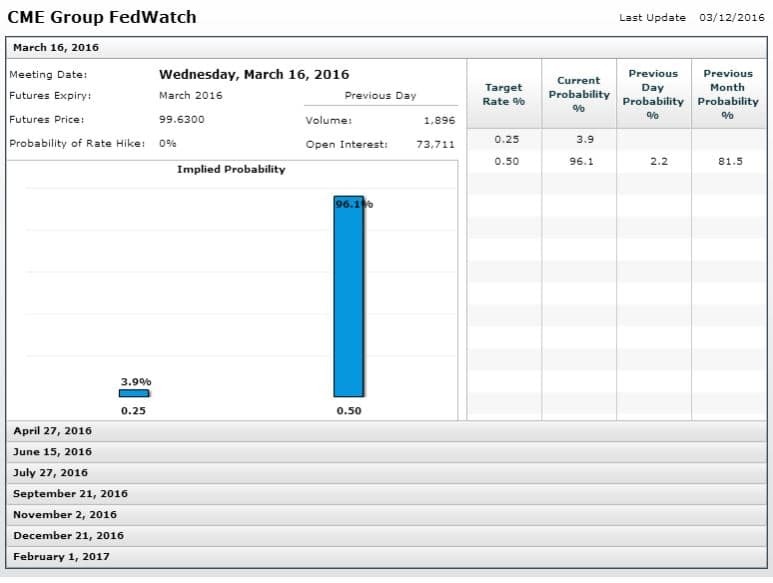 As of March 11, the indicator shows the probability of a March rate hike at 0%. The probability of a rate hike in June rises to 43%, in September to 61% and in December to 75%. In December, the Fed originally indicated that it may follow its first rate hike in almost 10 years with as many as four this year. However, financial volatility highlighted by a steep sell-off in the global equity markets prompted speculation that the Fed would move much more slowly. Although the Fed Funds Indicator suggests at least two rate hikes this year, likely in June and December, conditions aren’t right at this time for such a move. There are several reasons behind this line of thinking. Among them is low inflation, driven by the fact that oil prices are still far below their 2014 top and an economic slowdown in China. Negative interest rates in Europe and Japan have also make it more difficult for the central bank to raise rates. In its new statement, the Fed is not likely to try to build a case for holding rates near historically low levels, but rather it is going to explain that it is keeping its options open and that a rate hike is still “data dependent”. It is also not expected to significantly change its economic models or policy forecasts. Since its last meeting in late January, the U.S. economy has showed signs of strength that might support a rate hike eventually. These include the gradual rise in oil prices since the lows of late January and mid-February and a strong recovery in the U.S. equity markets. Additionally, the labor market continues to improve. The FOMC Committee’s vote is likely to come in mixed if comments from two Fed officials are any indication. Earlier this month, Federal Reserve Governor Lael Brainard said the U.S. economy isn’t immune to global risks and called for careful adjustments to the policy rate to preserve the expansion. She called for more patience while Fed Vice Chairman Stanley Fischer saw signs of inflation. Brainard said there are reasons to expect continued gains in employment, stabilizing growth in foreign economies, and an eventual rise of inflation back to the Fed’s 2 percent target. “However, there are risks around this baseline forecast, the most prominent of which lie to the downside,” she said. “Given weak and decelerating foreign demand, it is critical to carefully protect and preserve the progress we have made here at home through prudent adjustments to the policy path,” she said. On the other hand, Fischer contested the idea that the connection between low employment and inflation was broken, and said it may be reasserting itself now. The nation’s unemployment rate was 4.9 percent in February. “The link has never been very strong, but it exists, and we may well at present be seeing the first stirrings of an increase in the inflation rate – something we would like to happen,” he told the National Association for Business Economics. Given the comments by Fed members Brainard and Fischer and the state of the economy, the price of oil and the negative rates in Japan and Europe, it is going to be hard for the Fed to raise rates in March. However, June will be another story. The charts indicate that a hawkish Fed statement is likely to be bearish for U.S. 30-Year Treasury Bonds and 10-Year Treasury Notes. Rising interest rates should be bullish for the U.S. dollar because they will make the greenback a more attractive investment.